A chance for the mind to wander as the sisters Waley-Cohen—violinist Tamsin and architectural compositor Freya—conceptualize a protean physical reality. The process of writing Permutations was an unusual one. It grew out of a close collaboration with both my sister Tamsin and the architectural designers Andrew Skulina and Finbarr O’Dempsey. Inspired by Finbarr and Andrew’s habit of personifying the buildings and structures they designed, I thought of my musical material as a set of characters. I developed several different musical characters but wrote them both for six part violin consort, and for solo violin. From the beginning, it has been a process of constantly rewriting, reinventing, and transforming these characters in many different ways—while still maintaining an individual personality for each. Permutations was written on a three-year Open Space Residency at Aldeburgh Music. During this residency Finbarr, Andrew, Tamsin and I have been working together to create the music and an architectural setting which, when installed together, become one artwork. The architectural intervention is a set of six chambers which spatially distribute the six recorded violin parts in Permutations, but also give the listener the opportunity to change the acoustic properties and level of isolation for each part. Handing a certain level of artistic and creative power over to the listener was the guiding force in the creation of the artwork. Tamsin started playing the violin when she was 3. She also happens to be three years older than me, so listening to her play the violin was etched into the soundscape of my world from the beginning. Knowing her playing intimately was key to the way I wanted to hear music for Tamsin started playing the violin when she was 3. She also happens to be three years older than me, so listening to her play the violin was etched into the soundscape of my world from the beginning. Knowing her playing intimately was key to the way I wanted to hear music for 6 recorded Tamsins. Many of the characters I created in Permutations grew out of my love for her unique sound—from dark, fiery dance-like moments, to delicate pizzicato sections, to the singing melodies that appear shortly after the opening chordal passage. Another source of the sublime is infinity [...]. Whenever we repeat any idea frequently, the mind, by a sort of mechanism, repeats it long after the first cause has ceased to operate. The reflection of these ideas in Beethoven’s powerful fugal subject led me to play with the palindrome, changing the intervals while keeping the pattern constant: for example, changing the pivotal interval, while keeping the outside intervals constant, or exchanging major intervals for minor intervals. I enjoyed the way the patterns sounded somehow both familiar and unexpected, and so I began to use them for my sketches, sometimes sticking strictly to the notes in the palindromes and sometimes improvising around them or moving freely from one to another. There are two moments within Permutations in which the linear nature of the musical structure is interrupted by the parts splintering off into six simultaneous soli, each in their own tempi. These solo parts are the solo versions of six of the musical characters from within Permutations. Each of these was written so as to inhabit a different sonic space from the others, whether in terms of pitch and range, timbre, or dynamic changes. For this reason, it is possible to let your ears explore different lines individually, even while noticing their various interactions with one another. Alternatively, you can listen to the sound as a whole here, and even find order in the moments of narrative stasis and chaos. Often when I’ve discussed Permutations with other composers, they’ve been shocked and somewhat disconcerted that a composer would ever give so much power to her listeners. Here, by working closely together with Tamsin and the magical Nick Parker, Mike Hatch and Robin Hawkins who produced and engineered this recording, I take back that power and present Permutations in perfectly balanced ensemble. It may be interesting for you to read more about the architectural element of the creative process, as the writing of the music and the designing of the chambers have been so completely intertwined. Permutations is a touring project exploring the social capacity of architecture and music. 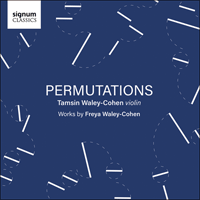 It consists of a new piece of music written by composer Freya Waley-Cohen, performed and recorded by violinist Tamsin Waley-Cohen and an architectural setting designed by Finbarr O’Dempsey & Andrew Skulina. Both the music and its setting are developed simultaneously, each acting as a muse for the other. The composition is written for six recorded violin parts. The architectural setting is a means for spatially distributing and affecting the recorded solo violin parts, which are housed within six individual chambers, each with changeable levels of acoustic enclosure. A central space will be formed and shared by these chambers, in which all of the violin parts are experienced as equally balanced and combined as a complete ensemble. Listeners will be able to explore the different textures and counterpoints that emerge within the music by moving through the chambers and adjusting the doors that make up the chamber linings. In navigating the performance, the listener will be presented with the opportunity to experience the solo, duet or full ensemble in counterpoint, contingent upon their movement through the space. The architectural setting is interactive and changeable: the audience encouraged to play the space like an instrument. Each chamber is lined entirely with openable doors that allow the listener to adjust the acoustic environment and therefore the thresholds between each violin part. Opening and closing doors, along with the audience’s movement through the space forms an intrinsic part of the performance. The proposal is designed to be structurally autonomous, and will be constructed out of a robust system of prefabricated parts so that it can be erected and dismantled with ease in order to enable it to tour multiple venues.